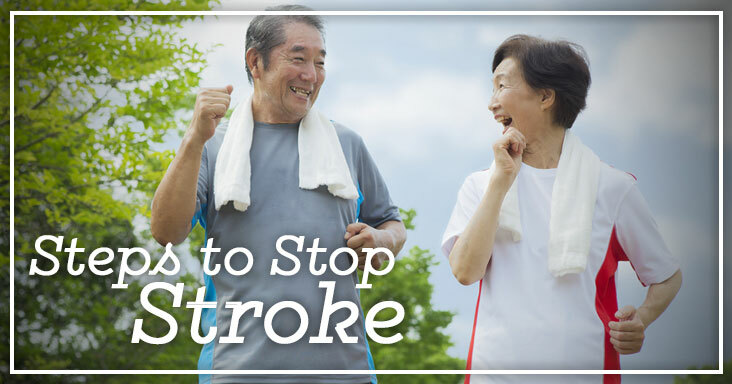 According to the National Stroke Association, physically active individuals have a 25-30 percent chance of lower risk of stroke than less active individuals. An easy way to incorporate exercise into your day is to walk. You can do it anywhere, it’s free, and it’s low impact so it can help build strong bones and muscles with a low risk of getting hurt. Before starting any exercise program, check with your physician. Start small. Warm up at a slower pace for the first five minutes of your walk; then walk at a brisk pace to get your heart rate up. You should be breathing heavier, but still able to talk. Go back to a slower pace for the last five minutes of your walk. Determine your own length of time that’s comfortable for you to walk at the beginning. Add a couple minutes to your walk every week. Try to walk at least 5 days a week. Ultimately, you should aim for a minimum of 30 minutes per walk. But, if you can walk longer, go for it. This is one case where more can be better! South Texas Rehabilitation Hospital is part of Ernest Health. Ernest Health provides specialized medical and rehabilitative services to our patients through our rehabilitation and long-term acute care hospitals. We treat patients who often are recovering from disabilities caused by injuries or illnesses, or from chronic or complex medical conditions. Our leadership team brings extensive healthcare experience to South Texas Rehabilitation Hospital. We invite you to meet them and learn more about why they are passionate about healthcare. At South Texas Rehabilitation Hospital, we are committed to being good neighbors and responsible corporate citizens in the Brownsville community.